Now a new study from researchers at Harvard reports that Americans who eat two or more servings of brown rice a week reduce their risk of developing Type 2 diabetes by about 10 percent compared to people who eat it less than once a month. And those who eat white rice on a regular basis — five or more times a week — are almost 20 percent more likely to develop Type 2 diabetes than those who eat it less than once a month. Just replacing a third of a serving of white rice with brown each day could reduce one’s risk of Type 2 diabetes by 16 percent, a statistical analysis showed. A serving is a cup of cooked rice. 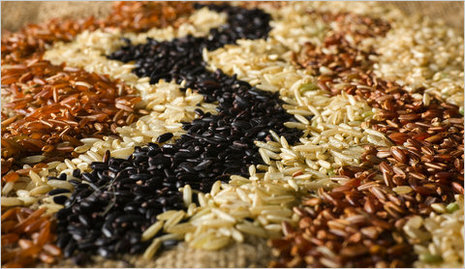 Study finds eating brown rice rather than white can lower the risk of diabetes. Yet doctors warn that there's more to this effect than the nutrition in rice alone. In a study of almost 200,000 people in the U.S., white rice consumption was linked to type 2 diabetes, researchers from Harvard University report in the Archives of Internal Medicine. According to them, brown rice and wholegrain foods release glucose more gradually, making them a better choice that white rice, which can cause a spike in blood sugar. In the study, people who ate five or more 150 g servings of white rice per week had a 17 per cent increased risk of diabetes compared to those who consumed less than one per month. White rice, a staple in the Asian diet, has been blamed for raising the risk of type 2 diabetes because it elevates blood sugar levels right after meals. 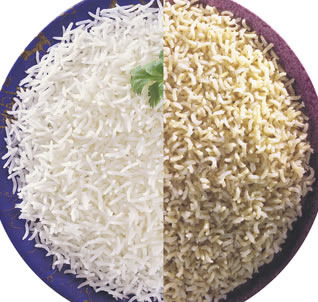 But the picture has not been as clear in other populations where rice isn't consumed nearly as often. New research from Harvard pooling three large, long-running national studies shows that Americans who ate more white rice also had a moderately increased risk of diabetes, but Americans who ate brown rice had a slightly lower risk. Substituting brown rice or other whole grains for white rice could cut that risk by as much as 36 percent, the researchers conclude in an article published in today's Archives of Internal Medicine.